A dedicated theater is the perfect way to watch your favorite movies. Optimized for sound and lighting conditions, a well-designed private cinema is almost imperceptibly different from a commercial space. The two biggest differences? The room is customized exactly to your tastes, and you only have to share it with your friends and family. But in terms of tech, you’re getting the same high quality you can expect from a commercial venue. Ultra HD 4K projectors offer some of the sharpest pictures you’ll ever see. Dolby Atmos surround sound can make a five-channel system sound like 60. And one touch controls of your AV, lighting, and thermostat mean you don’t have to get up from your comfortable, customized seating to change any settings. Much like a home theater, a listening room is a place optimized for great sound quality. That means the walls are sound proof and treated with acoustic panels that help absorb sound and minimize echo. But instead of an immersive surround sound system, you can enjoy your favorite music the way it was meant to be heard – with a high-performance two-channel audio system. It may seem old-fashioned, but whether you’re listening to a classic vinyl collection or streaming lossless tracks from Spotify or Tidal, two-channel is still the best way to go. Featuring optimal sound staging and resonant, floor-standing speakers, your listening room will recreate the feeling of sitting front row at a concert. Whether you’re all about hosting big parties with your friends and family, or you simply want your media to follow you wherever you go, audio video distribution is an essential part of a smart home control system. With your connected touch-panel controller, you can pause a movie in your theater and pick up exactly where you left off on your bedroom TV. And if you’re enjoying a few friends over, a few more swipes will let you create different music playlists for each room, making your home the ultimate party destination. 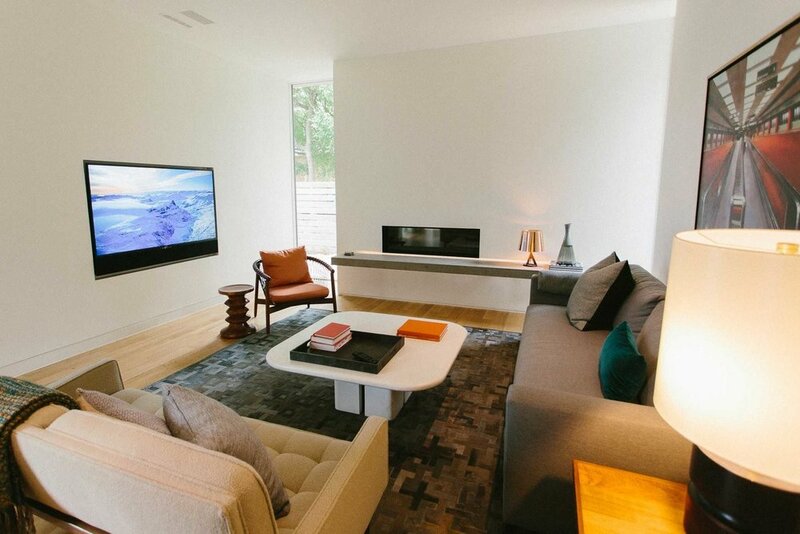 How else can smart home control transform your property into an entertainment escape? Find out by calling one of our experts at 512-997-9001 or filling out our online form.